August 14, 2015 Port Townsend, Washington - Port Townsend is a small town of about 10,000 people on the Olympic Peninsula and the strait of Juan de Fuca that comes from the Pacific Ocean. As far back as 1792, settlers recognized the value of the protected natural harbor and it became a busy port city. 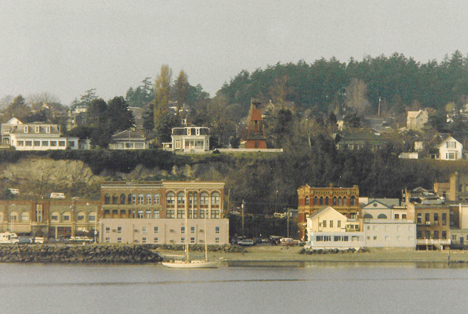 Center of downtown Port Townsend seen from Port Townsend Bay. Port Townsend is 25 miles northwest of the Naval Air Station on Whidbey Island that was commissioned officially as U. S. Naval Air Station Whidbey Island on September 21, 1942, followed by the creation of Ault Field where the earliest squadrons of aircraft were F4F Wildcats during World War II. Wikipedia reports that "today, there are seventeen active duty squadrons and three Ready Reserve squadrons based at NAS Whidbey Island. The base continues its longstanding role as a center of activity for Naval Air Reserve operations and training in the region that includes over 50 tenant commands."